This product is a medical device, please use carefully read how to use and use the company notes. 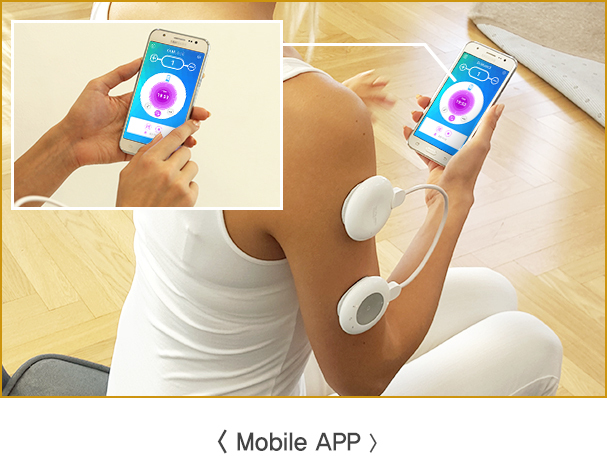 Dr.MUSIC 3 works as a massage therapist synced with music of your choice that stimulates nerves and muscles in the best of the music. 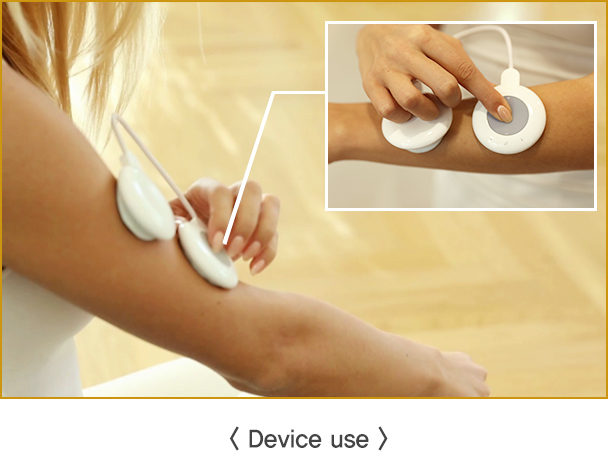 The electrical stimulation passes through your skin reaching the region of pain in your body to relieve the pain. It’s smart accessory in white, simple design with a neat look. It’s synced with music giving a variety of pulse in stimulation following the bests in the music. It’s wireless feature allows you to move around freely white using it. It’s small in size with gentle stimulation. It’s slim and small size makes it more portable and easy to carry around. APP that is available both on iOS and Android. You can use this device using the mobile APP either on Android or iOS anywhere. It’s slim and light feature allows you to attach them under your clothing and use conveniently. 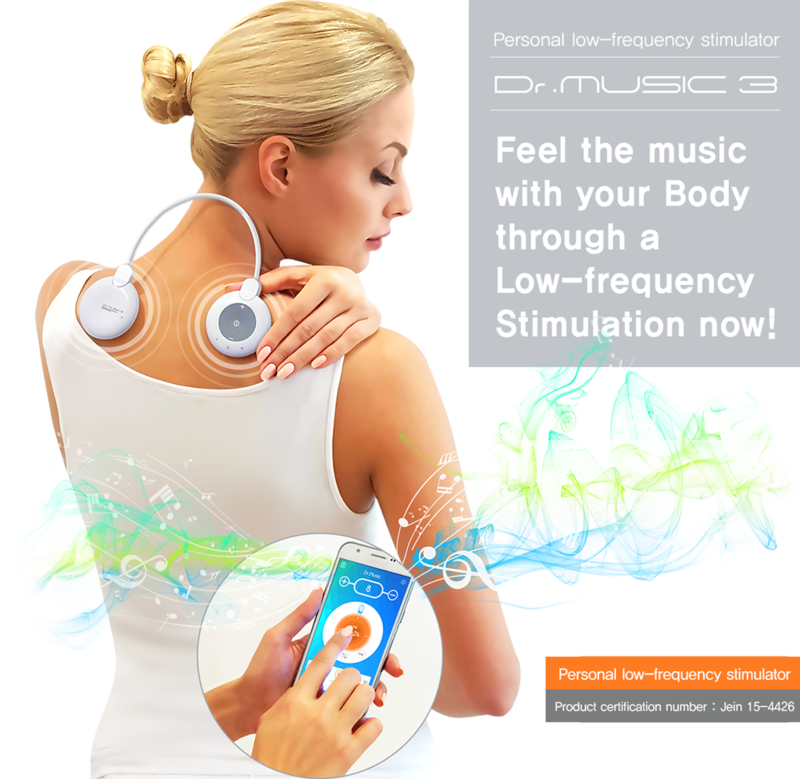 Dr.MUSIC 3 is an 1 channel, wireless, personalized low-frequency stimulation. You may control the pulse strength using a mobile APP. Rechargeable Micro 2 pin USB cable and adapter(DC5V 1A or above) are for separate. Use a convertible certified product to charge. The battery lasts max. 8 hours once fully charged. Battery Indicator Indicated the Status of the battery charging. Electrode connector Connected output socket with electrode for Low frequency stimulus. 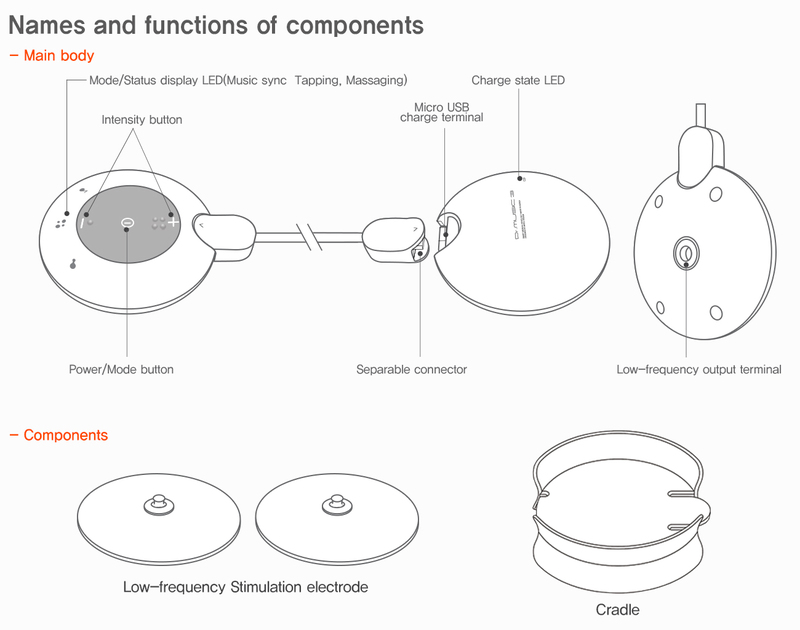 (1) Electrodes for low-frequency stimulation: Transferring low-frequency output to the body by attaching to skin. 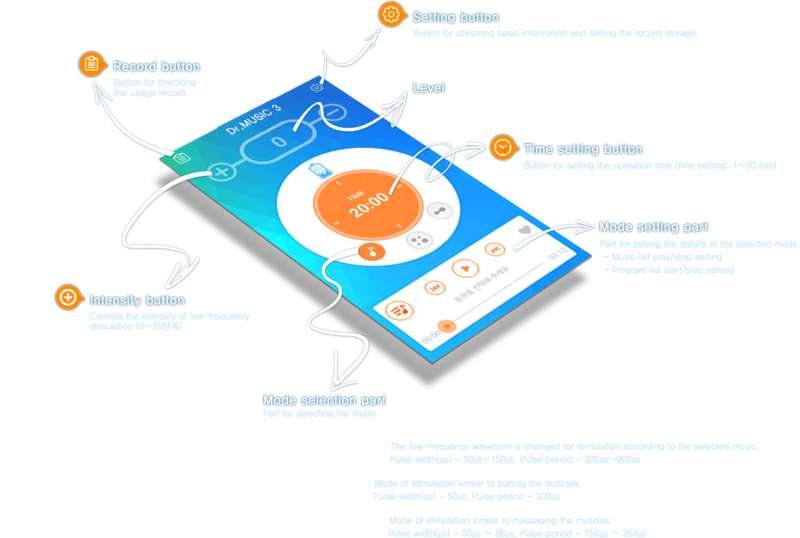 (2) Mobile APP: Used by installing at the mobile platform, sets and controls the device.